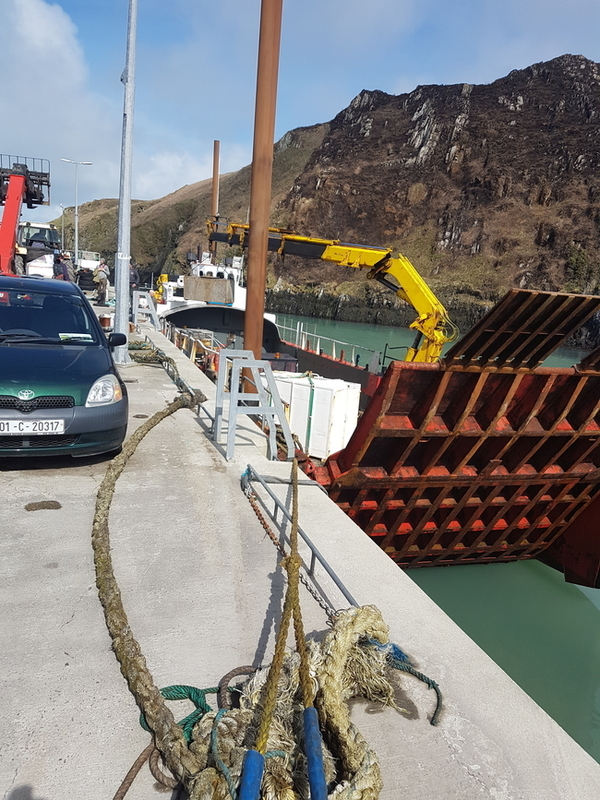 Yesterday morning passengers w ere greeted by the welcome sight of the Dún Aengus ferry again available for embarkation after being trapped for 6 days inside the closed storm gates. 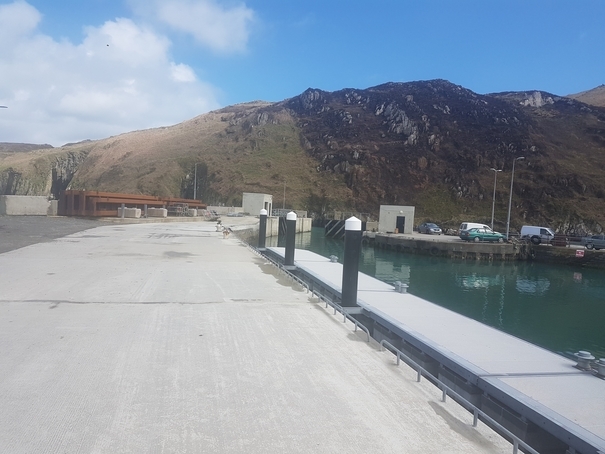 Late the previous evening a Dept Marine engineer, assisted by locals managed to open of the gates allowing the vessel to come out, bringing to an end 6 days of a reduced service with our 12 pax. vessel Deep Star. We were fortunate that the weather was so good during this time and many passengers greatly enjoyed their trips on the Deep Star. However, for the same reason, quite a few other intending passengers, particularly day visitors were unable to travel due to the very restricted numbers we could carry. The suppor t of the ro ro service was fantastic in bringing all kinds of cargo including light cargo such as Fields and indeed also limited number of passengers, thus alleviating the pressure on the Deep Star. The legendary flexibility of Fields themselves allowed us to maintain deliveries albeit at different times than normal and the support and good humor of others was much appreciated. As we ponder the shortlived inconveniences, we are also increasingly discouraged by the lack of progress in other important areas of our infrastructure. We show a photo of the large gaps in the South Harbor wall, it almost defies belief that we are approaching the main visiting season with matters left in this condition. We sincerely hope that it will not take a mishap or worse with small child or another vulnerable person before this is put right. Now is the time, and time is short !. We also aplogise to readers for having mislead them in previous blogs about the roads being put right before the summer. This we were told and this we genuinely believed but it would seem virtually impossible that this could now be achieved, even if works started next week. 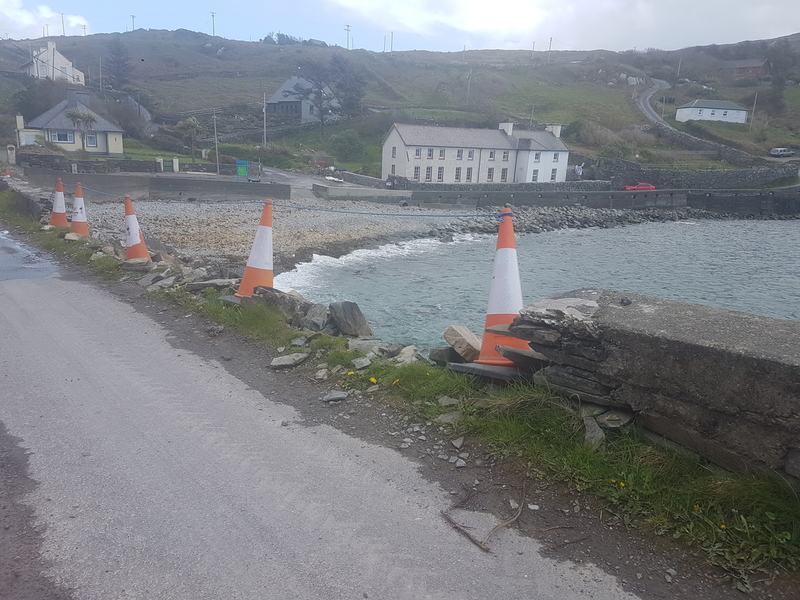 For many Islanders there is a sense of weariness at the longstanding nature of these conditions, we only hope that the 'Powers that be' will finally get their ducks in a row and sort the matter out.